How are dental lumineers different from traditional veneers? Dental lumineers are a little different than your average dental veneers. To find out if they’re right for you, be sure to make an appointment with us today. Dental lumineers are unique because they are ultra-thin (approximately 0.2 mm) and highly translucent, allowing them to replicate the natural appearance of enamel. 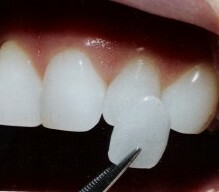 Traditional veneers are little thicker, requiring the preparation of your original tooth structure. Lumineers are so thin that little to no tooth reduction is necessary. Lumineers can be used to give a patient white, straight teeth in about two weeks. If you are looking for minor changes to the shape, length or size your front teeth, lumineers maybe the right choice for you. Dental lumineers cannot dramatically change the tooth size, shape, or length of the teeth as Veneers can. Lumineers are a perfect solution for patients that desire white teeth but have not had success with whitening in the past. If your teeth are hard to whiten, you may consider Lumineers to give you a brighter, whiter smile. Porcelain dental lumineers offer a dramatic change. They are as thin as contact lenses and can be bonded directly to the tooth with minimal drilling. Lumineers mask imperfections and make teeth permanently as white as you desire them to be, They are made of high-grade porcelain that looks natural, and blends beautifully with the surrounding teeth. Lumineers are resistant to staining or discoloration and get rid of the appearance of stained teeth. Little to no anesthetic is needed for the procedure. Little to no tooth structure needs to be removed for placement. They provide dramatic results to correct minor imperfections. If no tooth structure is removed, some feel lumineers can look “bulky”. There is little room for adjustment because they are so thin. Impeccable oral hygiene routine is required at home for proper maintenance. Does dental insurance cover lumineers? The cost of dental lumineers ranges from $800-$1000 per tooth in Lincoln, NE. At Northstar Dental we offer dental payment plans and affordable payment options. Lumineers give the cosmetic benefits of orthodontics and give you a tooth shade that will never need to be “touched up” with regular bleaching. In as little as two weeks you can have a smile makeover that will positively influence both your personal and professional lives. While the cost of dental lumineers can be overwhelming, Northstar proudly partners with Lincoln Dental Plans to bring you affordable dental care. Click the link to their website to learn more! We believe that dental lumineers are one of the most versatile smile solutions out there. Their bright white translucence allows them to be a great teeth whitening solution. Similarly, they’re effective at making your smile look straight and even. Because lumineers aren’t offered through every dentist, our patients usually have a lot of questions about them. Following are some of our most frequently asked questions about lumineers. What’s the difference between dental veneers and lumineers? Essentially, lumineers are a brand of dental veneers. They are a little bit different from traditional veneers, however. As veneers, lumineers are a little thinner and shine more brightly. This is because of the material from which lumineers are made. Dental veneers are not lumineers, but lumineers are a type of dental veneer. While most dentists wouldn’t call them “permanent,” they do have the potential to last up to 20 years. If you take good care of your lumineers they’ll last a long time. Taking care of your lumineers is as simple as good home care! Make sure to brush your teeth twice a day, and floss every day. This will help remove plaque from beneath your veneers, and keep your mouth healthy in general. While you can have lumineers removed and replaced, it’s important to know about how dentists prepare your teeth for any kind of veneer. When you elect to receive a dental veneer, your dentist will need to prepare your tooth. In most cases, they’ll roughen the front surface of your tooth to make allow the veneer to bond more effectively to your tooth. As a result, your tooth will forever look different when you get veneers. Because of this, lumineers are a better long-term option. Being aware of this fact is important so you aren’t disappointed in the long run.